The IMF world map locator had a little bug, my mistake. I was only displaying th first 99 entries. This is corrected. Thanks to the reader from Norway. Just attached the images to an email, and send it to: post@imf-gallery.posterous.com . Please add any relevant tags in the subject line, following that syntax: ((tags: tag1, tag2, ..., tagN)), for example: Subject: My loudspeakers ((tags: imf, RSPM IV, Finland)). Same as above: attach pictures to the email sent to post@imf-gallery.posterous.com. Include an email address where you can be reached, and ((tags: forsale, IMF ALS40, London UK)) in the subject for example. You can then link to the ad after it has been published (the postings are moderated). If you think that some sound track is great for testing some feature of your stereo, tell why, and publish it! So anyone could buy the CD. Don't forget to include the MP3 file, and add the tag "sound" (same syntax as above: ((tags: sound)) in the subject line). The picture gallery address is: http://pics.imf-electronics.com (or pic, or pictures). It doesn't matter how many pictures you send, but don't forget to attach them! A picture gallery will be automagically created. It would be nice if everybody uses the same tags. For example, I suggest ((tags: brand, model, location)). "brand" and "model" could be a list, for example: ((tags: Quad, IMF, Quad 405, IMF RSPM, London UK)). The the "forsale" tag if needed. The posts are moderated. Please be patient until I publish them. Email me for any edit you want me to edit an entry (eg. change the forsale tag by sold). As I was writting there, I now have a new (personal) blog, and a twitter account. You can read the former, and follow me on the later. I removed the pair of IMF Super Compact's I had in the bedroom. 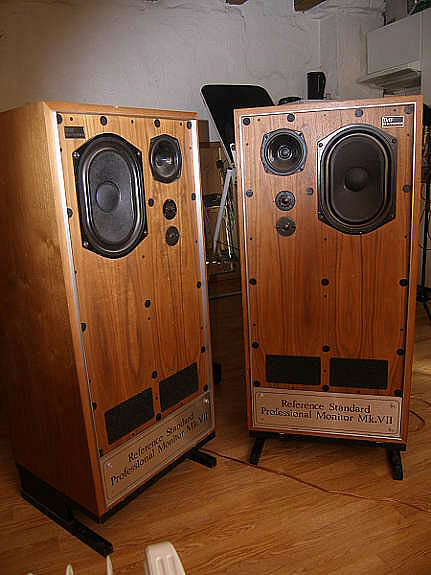 Not that I didn't like them, these are fantastic loudspeakers ! But i had 2 big boxes in the bedroom for more than 10 years (yes, girlfriend(s) not happy). So I decided to setup a nice little mono system. There is nothing wrong with mono when you're lying in bed reading, right ? Also you don't want to listen loudly at 3am right ? And who cares about deep bass, I can always add a sub woofer anytime later. Wh cares about the f > 15 Khz, I can't hear them ! So there. I hacked what was in those big boxes, namely a pair of non working Quad ESL63, make one working, and hook it to the Sansui AU20000. Connect the iPod to the Sansui, and there we go. It works very well, and the girlfriend is happy ! The Studio 4 speaker brochure is available from there http://www.imf-electronics.com/Home/tdl/studio-4. The Wolfram engine is now online ! 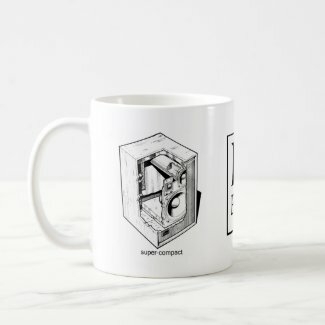 I've opened a store at Zazzle.com. Buy something ! A mug ? Why not a Mug ? The transition from the old web site to the new one is almost done. I have to update links in the Fried section, that's all. Please, send some feedback ! Almost everything from the old website has been moved to the new one, with some additions, and placeholders so more information can be added. I think that maybe 5 brochures are still missing. I'm a little bit disappointed because I know that some of the members of the IMF Electronics Yahoo! group have a lot of information to share, but only two people offered to help. Moving almost all the IMF data took me about 3 days working several hours per day (let's say 7 to 10). Plus the time to write the gadget which allows me to embed iPaper document inside the pages. The next step will be to add more pictures, and a driver gallery, probably shared between IMF/TDL and Fried. Because it's an easy way to share news on given topic, and allows user feedback through comments. It also allows the publication of articles by members of the community who want to share their thoughts on a given subject.